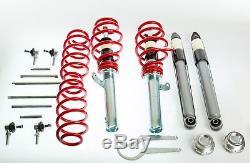 Adjustable threaded kit audi a3 8p + rods stab. Give your car a very sporty look and a superb ride with us. Threaded combination adjustable in height. Complete street tuning kit (German)! + rods front stabilizer bars. 50mm or 55mm force leg. For all models and engines. For 2-wheel drive and 4-wheel drive! Street-tuning-2014 offers you a kit with. A lowering in front of -20 to -80mm. A lowering back -20 to -60mm. 2 complete front threaded handsets. Assembly with the original cups. 2 rods rods stab av. A kit made in Germany. A kit make high quality material. Easy to adjust in height. The images are for illustration purposes! If you still have questions do not hesitate to contact us! We have the best customer service! Street-tuning-2014 is a Belgian company specialized in tuning! We are distributor of the range technix, tuningart, raceland and rokkor! Delivery will be made within 24 hours after receipt of your payment. All items are carefully packaged to ensure optimal delivery. All item descriptions are complete and consistent with the manufacturer's. The buyer certifies that the purchase made on our site, is strictly intended for exclusively personal use. Do not hesitate to contact us in case of problems or other questions. Any defective item will be replaced or refunded. However, the buyer must warn us of the problem within 48 hours after receiving the order. The return of the item is at the expense of the buyer. The return costs will be refunded, if it turns out that the item is actually defective or has a hidden defect. You may also be interested in .... The item "kit audi a3 8p adjustable threaded rods + rods stab" is on sale since Friday, August 4, 2017. It is in the category "auto, motorcycle parts, accessories \ tuning, styling \ suspension \ others". Tuning" and is located in bremen. This item can be shipped to the following countries: america, european union, australia.